Please select the desired membership level from the list below, and enter all the information requested to the best of your knowledge. Please be careful about your entries - use proper mixed upper and lower case as required (do NOT make entries in ALL UPPER CASE, nor in all lower case). The system will cause eventual rejection of registrations in ALL UPPER CASE or in all lower case. Please use proper mixed case to avoid having to redo your submission. During the application process, please note that you will be asked to designate which type of ARTA Membership Card you prefer. If you opt for the Membership ID Card (with photo), you will be asked to upload a picture (GIF, JPG, PNG format) no larger than 110 x 110 pixels. If you do not have a picture at the time of your application, you may upload it at a later time by amending your profile after you complete your membership application. 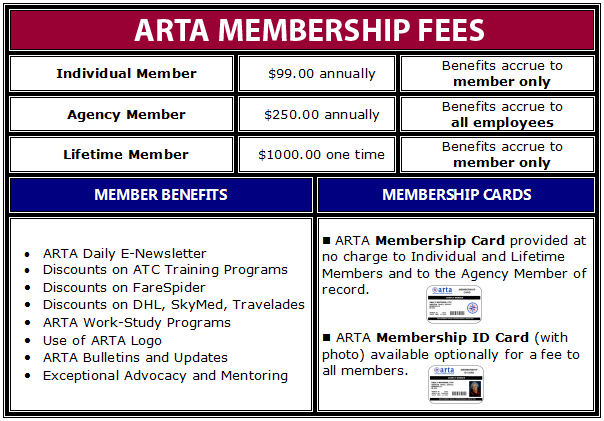 For more information about ARTA Membership Cards, please click here. Payment for ARTA Membership and ARTA Membership Cards is made by credit card exclusively via PayPal or with a PayPal account. It is not necessary to be a PayPal subscriber to pay by credit card. Thank you for joining ARTA.